Steve was born in Canada. Soon after his family moved to the United States (taking Steve with them, of corse). Steve, (now fluent in both languages) finished school, served in the Marine Corp, got married, had two beautiful daughters, became a firefighter/paramedic and… discovered the art of magic. Learning how to put a show together that would amaze an audience and make them laugh was a journey back to childhood. And he’s not coming back. His daughters are now grown-ups, 23 years in the fire service are now just fond memories and the show is better than ever. 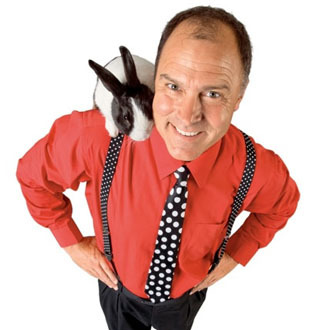 Steve Hamilton has been performing his comedy magic show around the world for almost 20 years. Audiences from Shanghai China to Valparasio Indiana have raved about his spontaneous humor and original routines. The Steve the Pretty Good show takes the classics of magic and gives them a unique and funny twist and then transforms his audience into hilarious magical assistants. Does someone get sawn in half? You bet. Can he make some one float? Absolutely. Will people be amazed and laugh, a lot? No doubt about it. Steve offers not only his hilarious stage show, but strolling characters also.